Bacon wrapped Pork Loin stuffed with Prosciutto & Provolone - Home.Made.Interest. This Bacon wrapped Pork Loin stuffed with Prosciutto & Provolone is a triple pork threat – bacon, pork loin and prosciutto! This may look like it’s hard to do, but I promise, it’s not. I consider myself a regular run of the mill wife and mommy, I am by no means a chef! 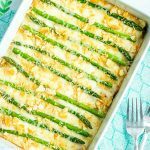 In just a few steps you can make your meals look fancy and I have tried to make it super easy with lots of pictures for every step. First you will trim your pork loin to remove the silver skin and excess fat. Here is a video that demonstrates how. One you have trimmed the pork loin you will butterfly it. Arrange the loin on a cutting board with the end facing you. Holding the knife parallel to the cutting board, begin along one side, cut about 1/2″ above the underside of the roast. Continue slicing inward, pulling back the meat with your free hand unrolling it like a roll of carpet. Continue slicing and unrolling until you have a flat piece of meat. Place some plastic wrap over the loin and, using a meat mallet, pound the meat until it is all the same thickness. 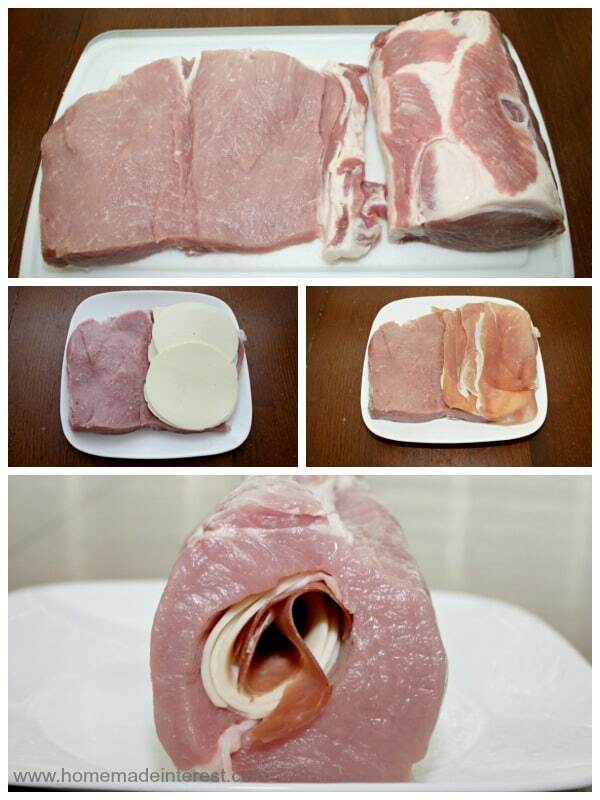 Remove plastic wrap and layer the pork loin with provolone and prosciutto. Then roll the loin back up and sit it aside. 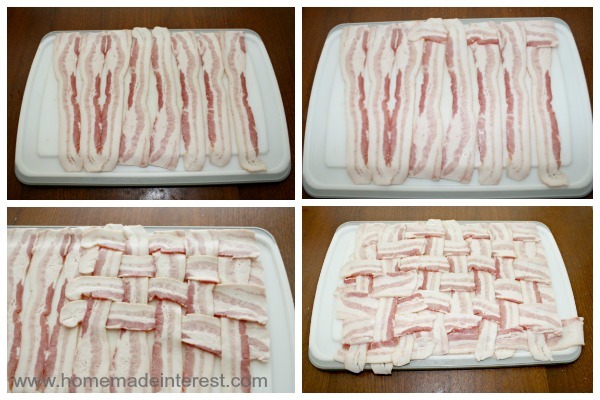 It’s bacon weave time! I know it looks complicated but it’s not (don’t tell your dinner guests though, let them think you are amazing!). Lay about 8 bacon strips down vertically. 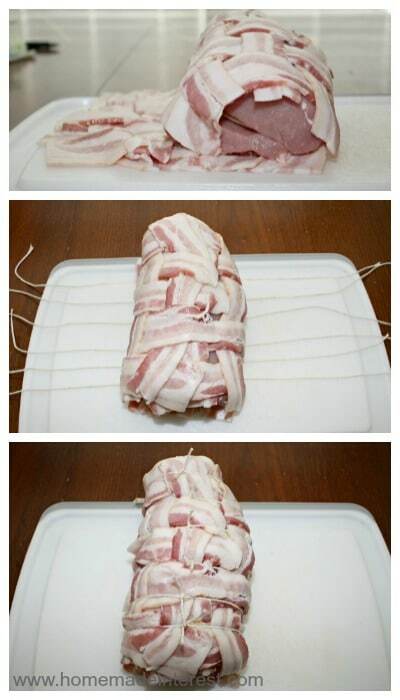 Begin the weaving process by weaving a piece of bacon through horizontally through the vertical strips. Alternate going over and under each vertical strip until you reach the end. Then begin your next row. When you have finished the bacon weave trim the excess bacon to so it makes a nice, neat square. Cut about 6 14″ pieces of cooking twine and set aside. 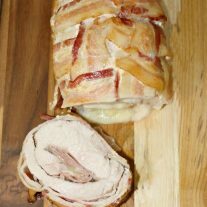 Place your pork loin on your bacon and roll it up in the bacon weave. Now gently slide the twine underneath the roast and tie tightly about 1-2″ apart. Grease the bottom of your roasting pan, place the wrapped loin in the middle of the pan and cover it (if your pan doesn’t have a cover use aluminum foil. Bake for 45 minutes covered then uncover and bake for an additional 15 minutes to crisp the bacon. When the internal temperature reaches 145 degrees your pork is done. Remove it from the oven and let it rest for 10 minutes before cutting. Impress you family & friends with this delicious and moist Bacon wrapped Pork Loin stuffed Prosciutto & Provolone. This is a triple threat, bacon, pork and prosciutto! Place plastic wrap over pork loin. Pound roast with meat mallet to make it an even thickness. Lay provolone and prosciutto on one side and roll together. Roll roast in bacon weave. Secure roast tightly with cooking twine 1-2" apart. Place roast in a greased pan and cover. Internal temperature should be 145 degrees. Uncover and back for 15 minutes to crisp bacon. Let roast stand for a few minutes before cutting. Follow Home.Made.Interest.’s board Food- Pork on Pinterest. For more pork recipes check out our Pork board on Pinterest. This looks amazing! My Daughter is a huge prosciutto fan! 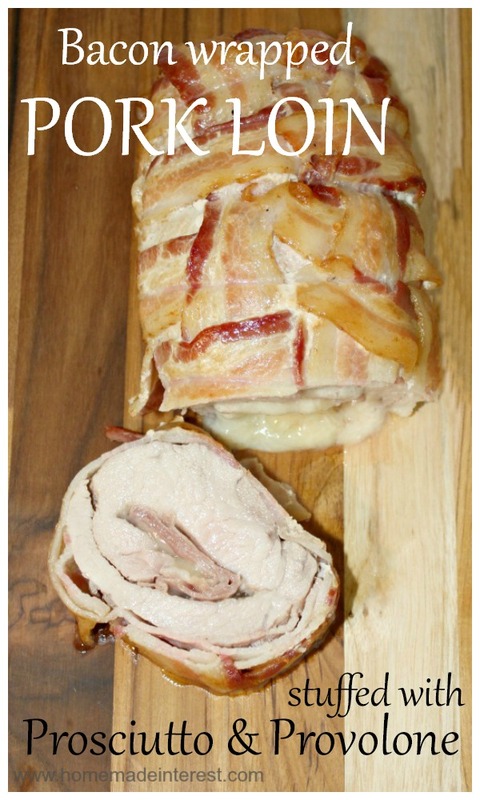 You had me at bacon wrapped…count me in…I’ll eat it :)x I’m trying really hard not to lick my screen here! Good Morning Melinda, I am popping over to visit you from Say G’Day. 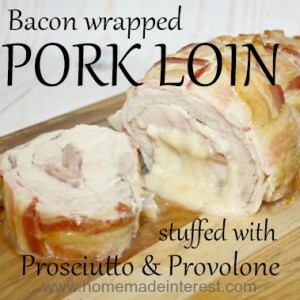 I love wrapped pork loin, but I have never used provolone cheese. 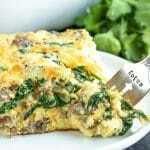 I am really looking forward to trying your version as I know my husband will love it. Thank you for the step by step instructions, they are so useful. This looks so amazing! I love anything wrapped in bacon! Bacon makes anything better and I love pork too! Right? When in doubt add bacon ! LOL, thanks Michelle! Hope he likes it! This looks WONDERFUL! Thank you so much for sharing this, you DO make it look easy. Thanks Carrie, it’s pretty darn delicious! This looks really delicious! Thank you for sharing it and your Dutch Baby recipe and cute craft projects at to What We Accomplished Wednesdays. Have a great week! Thanks Deborah, so glad to have you back. We missed you! Anything wrapped in bacon and we’re there! Loves amazing! Yummmy! Thanks for sharing with us at Your Designs This Time. My husband is sitting next to me and he just begged me to make this! Pinning and tweeting tomorrow. Thanks from both of us for sharing on Merry Monday! That’s what I like to hear! It is delicious! This is a pork lovers heaven!!! I am featuring it as part of my #FoodieFridays faves this week!!! Come on over and check it out!!! Thanks so much for linking with us!!! We are looking forward to seeing more from of these types of creations soon! 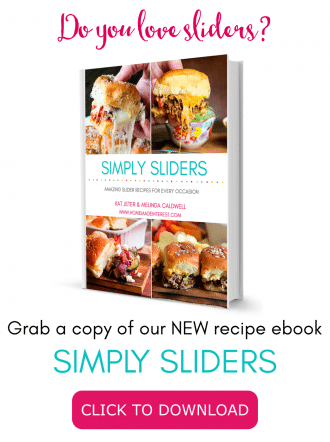 Thanks for sharing your delicious recipe post at the Say G’Day Saturday Linky Party. I’ve just tweeted about it! MMMMM…now I am hungry! 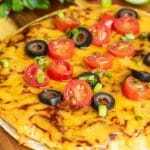 Thanks for sharing with the Thursday Blog Hop…looks so good! Anything wrapped in bacon is okay in my book. Thanks for sharing with #yuckstopshere link up. Please come share again next week. 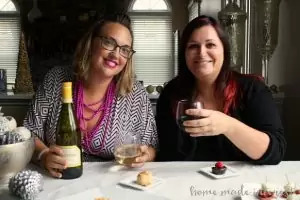 Thanks so much for sharing this at Savoring Saturdays, Melinda! Can’t wait to see what you share this weekend! Oh my GOSH, I would love to try this! Can you invite me over though because in all honesty, I would ruin this dish if I were to try and make it myself. YUM! 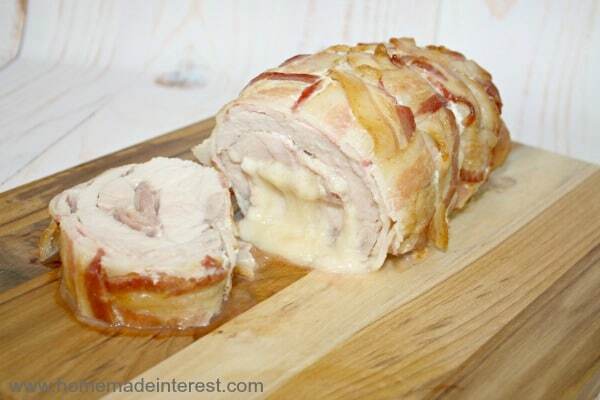 Oh this looks delish, especially the crunchy bacon on the outside. This looks amazing! I can practically smell it cooking ! Would you stop by and share this at “Celebrate It!”? 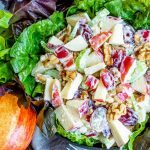 It’s a blog party where we celebrate the everyday things we do and we would love to celebrate with you! Hope to see you there! Yum! That looks amazing! You just can’t go wrong with bacon, and cheese! Thanks for sharing at On Display Thursday. Ok, this is amazing. Pinning. Thanks so much for sharing with Adorned From Above’s Link Party. We featured this post at this weeks party. It really looks amazing.